Saint Julian Press as a literary and educational organization embraces a vision to create a local and worldwide community, by engaging in an artistic and diverse dialogue that promotes world peace, cultural conversations, and an interfaith awareness, appreciation, and acceptance. In our mission as a new creative imprint we hope to identify, encourage, nurture, and share transformative literature and art of both past and living masters. While giving emerging artists, poets, and writers a place they may come home to and share their work; celebrating the enduring mystery within creation that calls us into relationship with one another. The Morrow Chapel at Trinity Episcopal Church in Midtown Houston has been the venue for Saint Julian Press quarterly events since our inception. It is one of the most inspiring artistic and sacred spaces in the Houston area. A space, we are immensely grateful to the church for sharing with us and the public that attends the reading events we offer with great humility of spirit. Our inspiration is Julian of Norwich, the Fourteenth-Century English mystic and Anchoress, whom scholars believe was the first woman to write a book in the English language. Her major work, the Sixteen Revelations of Divine Love, touches on the heart and calling of our mission as a Twenty-First Century literary imprint. Our hope is to publish transforming art and literature, which symbolizes’ a radical openness to the literary and visual arts, cultures, and faiths across humanity. Our wish is to open far and wide the doorways to an artistic dialogue and exchange with you. Building an ever-expanding inclusive community locally and globally that cultivates meaningful conversations across boundaries, secular societies, and encourages an interfaith exchange. Saint Julian Press is answering a call in the inmost sense of that word, for words and artistic expressions. We enter this endeavor for the pleasure of art and writing to help transform the world, our world. This is a passion in the deepest sense of that word, a call for a transformed world. Join us in this journey where you will discover new voices and songs of transformation and thoughtful provocation. 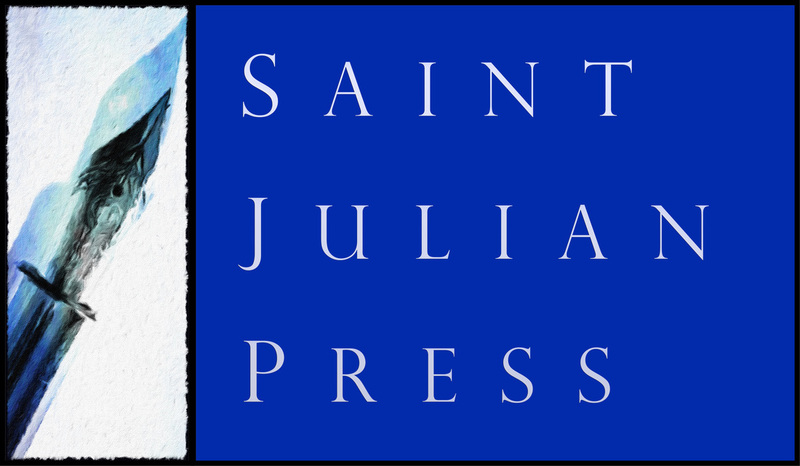 Saint Julian Press is just beginning, planting the first seeds with poets, writers, and readers alike. Our intention is to focus on transforming artistic works that inspire and create lives of compassion and creativity. Our wish is to work with artists, poets, and writers whose humble effort and brilliant light traces’ transformation. Our dream is to share works of art from many creative, innovative, diverse, literary, and artistic voices. There are numerous voices, established and new, whom we believe need to be heard, seen, and treasured. Our wish is to share the transmuting and literary works of artists, poets, writers, and musicians through public events and receptions, poetry readings, performances, books, and internet publishing, building new artistic communities. Our sincere desire is to share this visionary journey through several imaginative avenues a year, giving the public a unique and farseeing value to life affirming art, literature as language, cultural diversity, and evolving societies. Where we actively engage and share with communities and neighbors, the people with whom we live and breathe and share our lives with, new and known literary voices and art. You may contact us by sending an email.